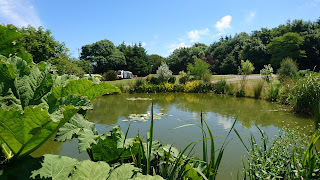 Our campsite is in an idyllic location and boasts spacious pitches. We have pitches with electric hookups. Options for larger pitches include one with a luxury pitch with a private pond side deck, grass or hard standings. We provide water and drainage. Excellent facilities on site include waste and water disposal points, toilet and wash basin, a wet room with a sink, shower and toilet, recycling point, freezer, washing up and laundry facilities.